The reason is simple - I absolutely love Public Lab community. While I have been on GitHub since around last year, I had not made any "real world" contribution until I came across Public Lab. I was way too hesitant to even strike a conversation and now thanks to Public Lab, I actively participate in discussions and bug fixes. I have learnt a lot in these 4 months. The community is extremely helping and I definitely feel that I am a part of this community and I am thankful to it. I cannot think of a better platform than Public Lab to spend my summer with. In future, I would love to remain and be a part of Public Lab. This community is hidden gem not many know about it. One of my post GSoC plan which I have mentioned later in the proposal is related to this. Goal of the project is to boost the performance of Image-Sequencer primarly by: 1). Using WebAssembly for pixel processing and many other applicable areas, 2). Using web-workers to run the project on an alternate thread 3). Editing various parts of the code based on lighthouse parameters and chrome audits. 4). Add Minify Image module. 5). Add demonstration based on calorimetry tool for detecting indoor formaldehyde concentration levels. After having an image of the above badge in appropriate light and framing conditions, we can have the ratio of avearge of pixles of both sides of this badge which can serve as a basis of indoor pollution levels. Installing Image Sequencer for the project. Taking the image as input and producing an instance of the sequencer object. Applying crop to have the left half of image (as default) which can be customized by the user and averaging the pixles with average pixel module. Applying import-image to reenter the image again to have the right part. Applying crop to have the right half of image(as default) which can be customized by the user and averaging the pixles with average pixel module. Determining the ratio of average of the red channels of the respective instances and output the ratio to the user which will be the indication of the formaldehyde results. After this we can plan to have various demos realting to the above and I will love to work towards a smartphone app, which we will be discussing at that time. Also, since I have worked with react native that works sfor both ios and android, I think that can be good option. 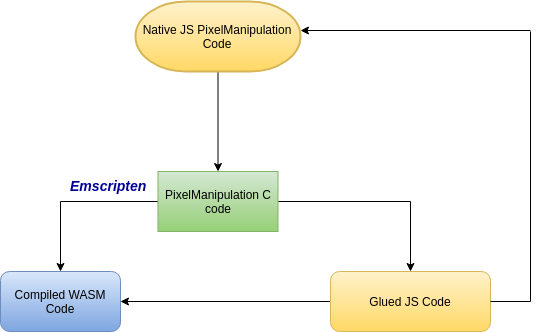 The PixelManipulation.js code is heavily used almost by all the modules provided. The purpose of this project is to enhance the performance of the code by converting it to WebAssembly. To the code part, the function PixelManipulation will still be created and our glued-js file can be required inside that. Now the C code written can be passed getPixels function from this file which we can utilize there to perform various tasks. Also after this the currently implemented modules can be converted to C and compiled to WebAssembly wherever it can be like many modules implement their own extraManipulation(), changePixel() functions such as Draw-Rectange Module, Gamma Correction Module et cetra. I will also be adding various tests regarding WebAssembly implementations and on a personal interest basis, would love to demonstrate the difference of speed we can attain with the help of one of the tests. The Run.js used inside run() function can be broken into sveral independent threads a required. Uses web workers when run in browsers and child processes when run by node.js. Also supports browsers which do not support web workers. // Everything we do here will be run in parallel in another execution context. Similarly, we can have drawStep function broken into parts and implemented to worker threads which do not have DOM manipulation as we cannot manipulate DOM inside the workers. After this we can look into several parts of code of sequencer to implement this. 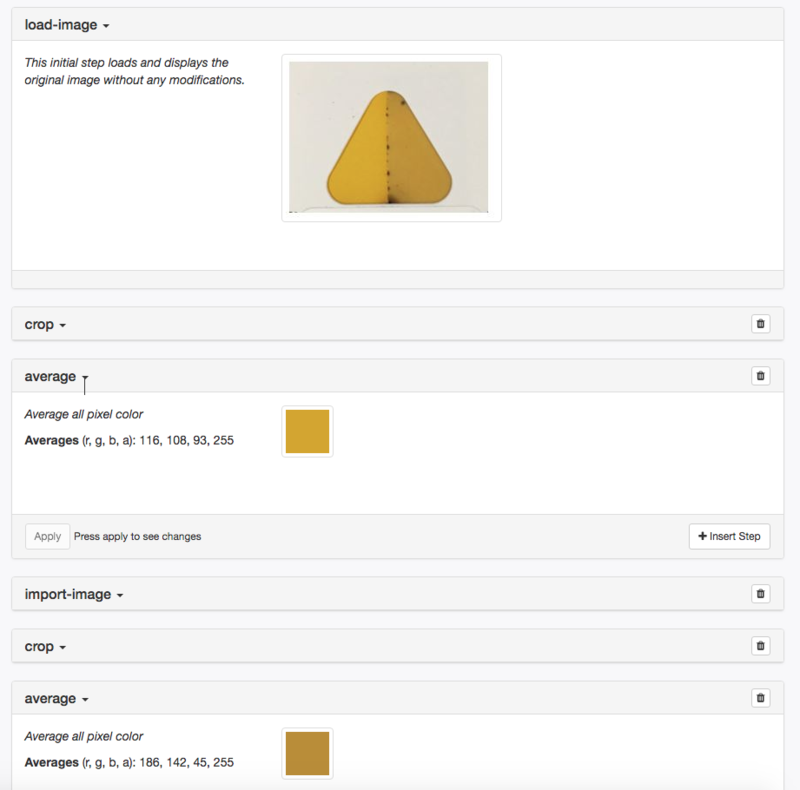 Using imagemin module for image minification. For those users, who want an optimized image. For some users who want to have faster results on image processings. For this, we can add an option for optimized version where like load-image we can have this module loaded at the starting. Also I will be adding various tests and a documentation section for the same. I will be adding tests including both unit and UI tests for various parts of the code. Next I will be writing documentation for various parts of code involving utilities and different use-cases. We can also have demonstrations of various real-world use cases. For this, we can plan to have demo GIFs and step to step guides et cetra. Since linting makes us write not only readable but reliable code as well, the code written would be properly linted in order to be less error-prone and to provide better readability. Adding comments makes code much easier to understand not only for a new contributor but also for the reviewers, I would add proper and efficient comments so as to make the code easier to understand. I would also add comments to various parts of code already written, I come across during coding and exploration period where ever it needs to be for the new contributors to have a self-explained code. Here, I will try to solve the issues and help other contributors doing so. Also I will be exploring more and more on webassembly and webworkers to get comfortable while working on it and open fto's and help new comers get their first PR merged. Adding to the above, I will be resolving any of the bugs in the crop module and prepare a library platform for calorimetry project. My End-semester exams will last till May 14th and since this comes under the community bonding period, I will try my level best to catch up with all the communication threads during this period and will be a very actively participating member post this. ALSO, I WILL BE ADDING CODE-COVERAGE TO THE PROJECT DURING THIS PERIOD. Transform native Js in PixelManipulation code to C and compile to WebAssembly. Also include the compiled WebAssembly to the original codebase. Discuss, explore and contribute to other parts of code including various modules where the heavy pixel processing can be done with WebAssembly. Complete new Module Implementation with wasm and emscripten. Also writing various tests related to WebAssembly not only ensuring proper functioning of code but also acting as a speed comparator. This also includes the first phase evaluation from June 24 to June 28. Add 'Minify_image' module and write appropriate tests. Write documentation for above module and add documentation for all newly added features. Help clearing any of the bugs if existing, discuss and implement UI improvements that can be done. Also work to increase performance based on lighthouse and chrome audits. Implement web workers for Run.js and explore and discuss other parts of code where using workers can enhance the performance with their async behaviour with mentors. This also included the second phase evaluation from July 22 to July 26. Implement all the new workers as discussed above with mentors. Complete any work related to web workers as necessary. Also start colorimetry project work structure which involves creating the basic workflow using sequencer. Complete any remaining work and implement remaining features like enhancing lighthouse based factors and also improving documentation as much as possible. Complete Colorimetry work structure. Final Evaluations from August 19 to August 26 and create a simple UI for colorimeter issue which will be enhanced with time. I would dedicate myself to make Image-Sequencer more and more performance efficient by implementing all the above-mentioned tasks and more as I will be able to figure out. Any help or review by other contributors would be highly appreciated. I have been actively participating in contributing towards this project since quite some time and have found a greatly helping and super-friendly team I love to work with. This is a simple practice project based on WebAssembly which draws an animation of 500 randomly colored circles on a canvas colliding with the edges of the container where the selection of colors, the velocity of circles is a C code compiled to web assembly using emscripten. This is a mobile app built with react-native built for both android and ios. The app will allow users to create different categories of flashcards called "decks", add flashcards to those decks, then take quizzes on those decks. This is a simple game based on react and redux. The game goes like this: A user is asked a question in the form: "Would you rather [option A] or [option B] ?". Answering "neither" or "both" is against the rules. In this app, users will be able to answer questions, see which questions they haven't answered, see how other people have voted, post questions, and see the ranking of users on the leaderboard. All the code written here is open source. I have also worked on Aparoksha Campus Ambassador admin app based on React and Redux working with my seniors. I have also worked on signup and login system for Q/A portal in collaboration with my Geekhaven colleagues. It was a node based registration system. I am also the coordinator of technical society of my Institute: Axios. We have made the placement website for the institute and currently working on institute's main website which is a private repo currently. I understand the importance of teamwork in any great project and Image-Sequencer member team being a super friendly one, has always motivated me towards the same. I believe this project can be helpful to small scale farmers and peasants where the health of their crops and soil can be analyzed and especially in a country like India where a majority of the people cannot afford to buy expensive equipment and pay loads of money for analysis. Since the project is also proceeding towards other real-world cases like particle-identification, quantified color differentiation between two patches on a chemical test strip, it can be quite a useful tool for environmental scientists and researchers providing them a handy visual tool they can use for various purposes. I would love to completely commit myself towards the project, understanding the dedication it requires I promise to dedicate any amount of time it takes for the program and since the program is happening during my summer breaks, I would be able to fulfill my tasks within time. I have not applied to any other organizations except Public Lab. This is also my first GSoC. Here, after having improved on performance of the project, I will proceed working towards various real-world use cases like in #979. This not only adds to a contribution for various environmental causes but is also a source of great learning for me as well. In addition to continuing working and improving on the project (like exploring and adding more performance-related features, add more documentation support , new UI implementations, maybe switching to a UI library like React or others as suitable et cetra), I would also love to keep contributing to Public Lab and other open source projects and learn as I grow. I realize that Public Lab is a hardworking and modest organization. It is a community where we let the people investigate environmental concerns by using inexpensive DIY techniques which in my terms is of high social and environmental importance and myself being a member of Public Lab and an active contributor of Image Sequencer promise to spread the word of awareness so that the purpose may be sound to a large plethora of people. I will begin by writing a manual for step by step usage of image Sequencer in regard to all its feature. This will ensure that people actually find and come across Image Sequencer and Public Lab. I will also work on spreading the word by writing Quora answers, making blog posts on platforms such as Medium. The main part of this improvement is making Image Sequencer as much performance-efficient as possible and to make it more and more user-friendly... Maybe next GCI we can make more and more themes for the project. I will definitely try to make my juniors and batch mates in college aware about open source and encourage them to start contributing as well by organising several awareness programs and meetups. I strongly believe in sharing knowledge and collective growth, thus I have always tried to encourage other contributors and newcomers to contribute to the project through opening FTO(First Timers Only) issues and I would continue to do so. I will allow for newcomers to contribute to the project by breaking up tasks into smaller pieces and opening FTO issues for easier tasks. I would love to work with other people on the project and will try to make the project as developer friendly as possible. I am no GPU or software developing expert, but I am a firm follower of - always follow the 50%-50% rule... 50% of the required work you should know how to do or at least how to approach, the other 50% you should have no idea about but be really eager to learn. I have carefully planned my work and I am more than just eager to learn. Thanks a lot Varun for your precious feedback! Will explore and try to meet the said changes as soon as possible. @tech4gt, @jywarren I have made some changes. Please have a look. This is great, thanks so much for your proposal, @lit2017001! We've really appreciated your contributions over the past months. I love these ideas. Because modules are so compact, GCI has been a great way to grow our community, and also in general the architecture has been great for newcomers -- contributing just one module is not so hard. UI testing will have to be part of this too, as the increasingly complex UI work (which is sooooo useful) is also more brittle, and has been breaking more often! And finally i wonder -- the optimizations will be awesome but perhaps you'd be interested in, towards the end of the summer, working on a real-world use case? This is a great vision, and I agree that our project has gotten to the point where we are moving faster in that direction! I also appreciate that you are focused on different performance improvements. I think these will be really critical for many of the real-world use cases. Re: real-world use cases, for example this one! https://github.com/publiclab/image-sequencer/issues/979 could be used for all kinds of colorimetric tests, soil tests, things like that! @jywarren I have added calorimetric demonstration use-case to my proposal. This) is the part added to the timeline. I have also added the test-coverage part which is added in the timeline to the community bonding time here).